MarieAntoinette is a Legacy Library. Legacy libraries are the personal libraries of famous readers, entered by LibraryThing members from the Legacy Libraries group. » Marie Antoinette's legacy profile. MarieAntoinette is also an author. About meArchduchesse d'Autriche, Reine de France et de Navarre, épouse de Louis XVI de France. 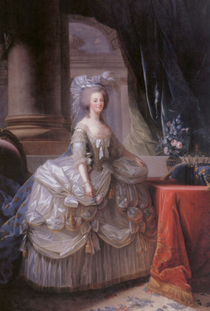 Marie Antoinette (1755-1793) was the Archduchess of Austria, Queen of France and Navarre, married to Louis XVI of France. About my libraryCeci représente ma bibliothèque personnelle du Petit-Trianon, qui comprend surtout des romans et des pièces de théâtre. Mes assistants à LibraryThing ont utilisé le catalogue publié en 1863 par Paul Lacroix comme base pour reconstituer cette bibliothèque. Ce catalogue est disponible chez Google Books en forme numérique. A catalogue of my library is available here on Google Books. This catalogue, published in 1863 by Paul Lacroix, represents my personal library from the Petit-Trianon palace, including the books kept in my boudoir, and mostly comprising novels and plays. I also had another, larger and more official, library at the Tuileries palace. Reviews in this catalogue signed "D.P." are not my own, but are from the notes of my contemporary the Marquis de Paulmy, as they appear in the Lacroix catalogue.